Things have been hectic around here as of late and I’ve been unable to write with the same commitment that I have in the past. However, never fear; Cake for Breakfast does still live. Between circus shows, training, and a consistent amount of freelance work, I’ve been up to my ears in busy. There is always something about this time of year that sends me into a massive To-Do list frenzy. I started the beginning of the holidays off just the way I wanted. I was lucky to have my mom visit me in the city for a little pre-birthday celebration and cheer me on as I did my first trapeze showcase. While the show was thrilling in itself, it was more thrilling that I had my mom there for support. We imbibed in yummy cocktails (perhaps a little too much) overlooking the gorgeous city, we had lovely, decadent meals, and the weather held up beautifully (it was a balmy 60 degrees, which is extremely rare for the middle of November). 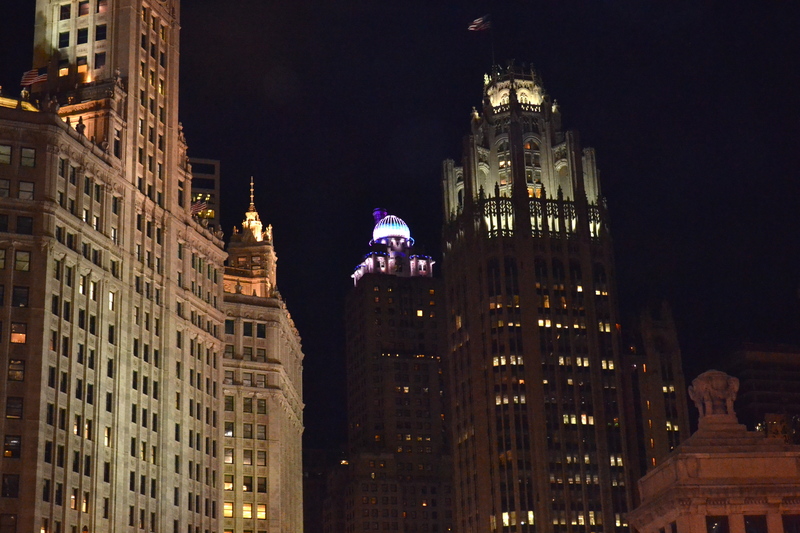 But as all good things do, the trip came to a quick end and she was whisking her way back across the good ol’ US of A. But it was just the visit I needed to finally get myself into the holiday spirit. While I’ve always been a lover of Christmas, I often don’t feel the holiday spirit in the weeks prior. I want so badly to feel the way I did as a child, but the last few years I haven’t felt festive. This year, though, I’m ready for Christmas. The idea of going home to visit my family, decorating the tree with hot buttered rums and my sweet puppy under toe just makes my heart warm. 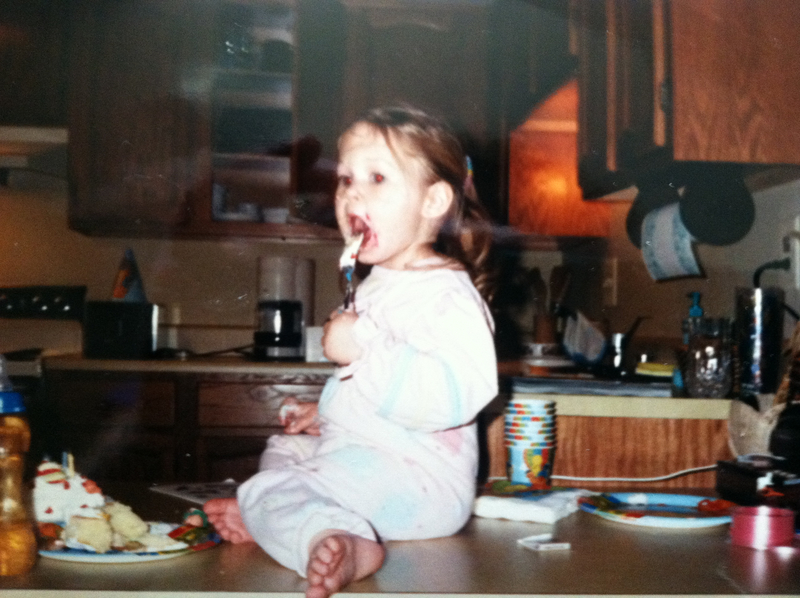 Some things never change…except perhaps I’ve gotten a little more refined about how I eat cake. Well, as this blog post so obviously explained, my birthday was the day after Thanksgiving. And while I didn’t get to go home for the holidays, my boyfriend’s family was sweet enough to take me under their wing and invite me to their holiday festivities. Wine was plentiful, the food was delicious and it was only a few blocks from boyfriend’s place so we didn’t have to worry about the holiday traffic. It was lovely, and a great way to ring in another year of being older. At midnight, boyfriend and I toasted with ciders and I opened one birthday present. The next day was filled with opening presents with a big cup of coffee in hand, followed by a normal, but casual, work day for us (we are both contract workers; therefore, taking multiple days off means you just don’t get paid. Since we aren’t independently wealthy, we worked a bit). Then we had a lovely dinner at my favorite Ethiopian restaurant followed by jazz music and cocktails at Al Capone’s old haunt, The Green Mill. I also had friends out to celebrate the occasion. It was just a cozy group of good friends and I couldn’t have thought of a better way to celebrate. And since I knew everyone would be coming over to the apartment on Saturday, I figured I better have a cake for everyone to eat. Everyone expects a cake on birthdays, and who was I to disappoint? I made the fondant first to make sure that it would turn out before I made the whole cake. I followed the directions from the Make It & Love It Blog. The recipe was easy to follow and the fondant turned out beautifully. I cleaned my countertop and then put ½ of the shortening in a thick layer on the countertop (the author recommends a layer about the size of a basketball). Sift the powdered sugar on top of the shortening. Then make a crater in the middle of the powdered sugar pile. 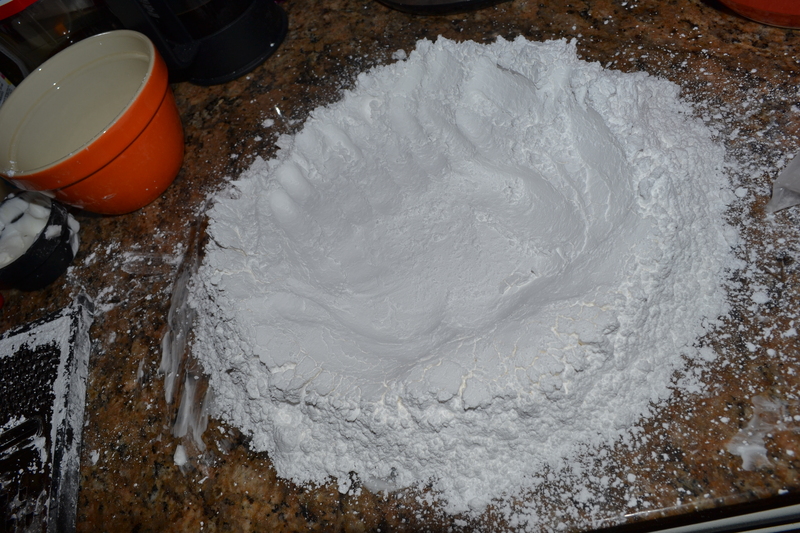 Ensure that there are tall sides all around the outside of the powdered sugar crater. 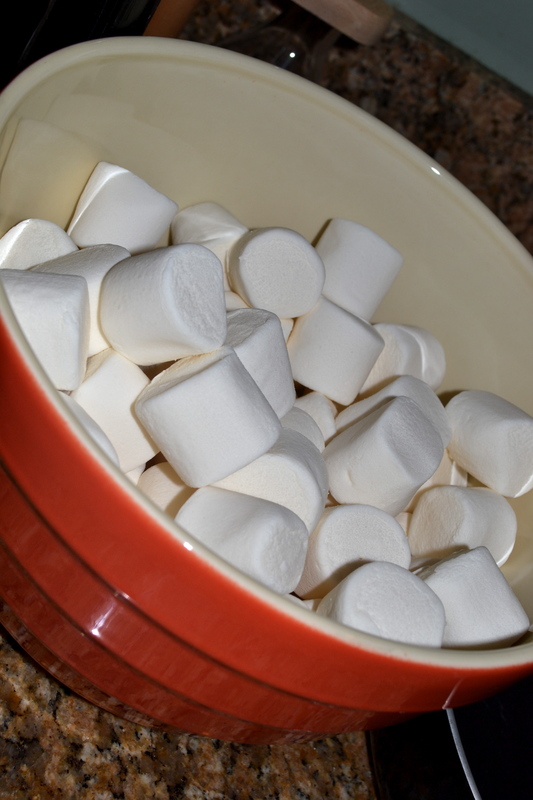 Now put the marshmallows in a microwaveable bowl and add 2 TBSP of water. Microwave the mixture at 2 ½-4 minutes. Since my microwave is pretty strong, 2 ½ minutes was all I needed. Just keep an eye out. 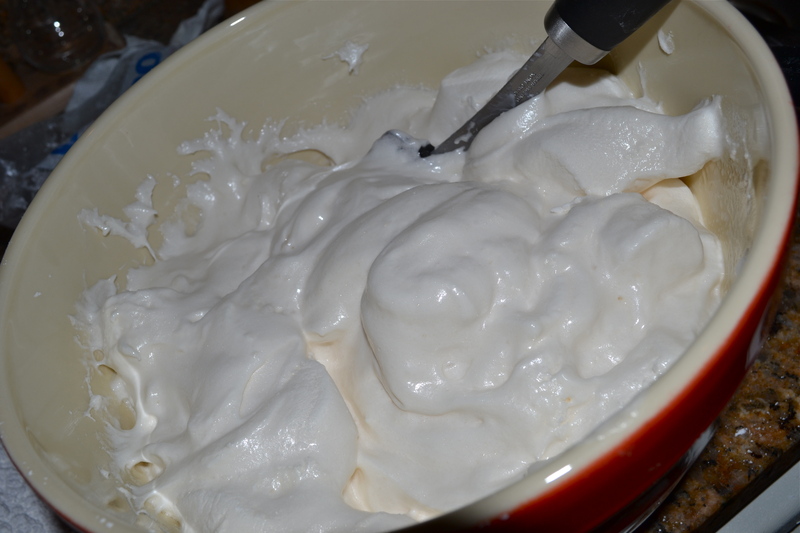 Now mix the melted marshmallows with a spatula so it’s smooth. Let the marshmallows cool a bit before this next step. Once the marshmallows are cool enough to handle, pour it onto the powdered sugar. Now for the not-so-pleasant part…liberally coat your hands with shortening (I know, I know). If you notice that your fondant is cracking or dry, add a little more water to it (just add 1 TBSP at a time). Once the fondant is fully kneaded, you can either use it right away or cover with shortening and seal in a zip lock bag until ready. Grease and line two round 8-inch pan with parchment paper. 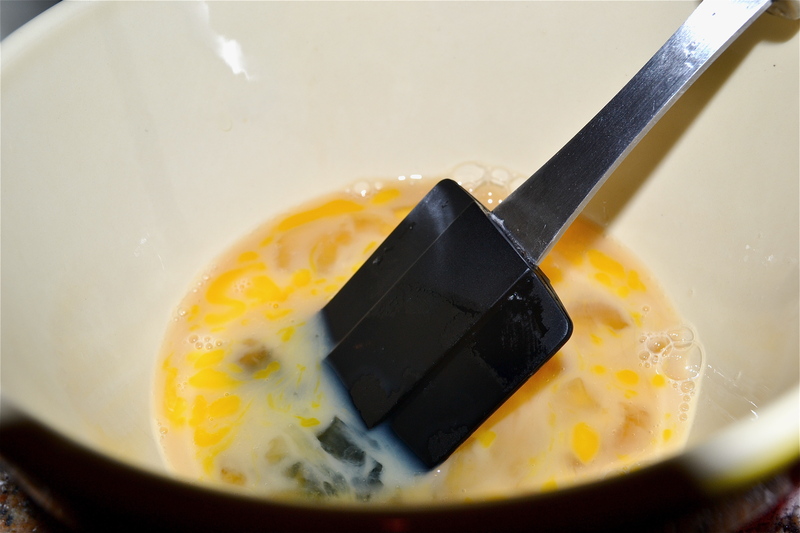 In a medium mixing bowl, combine all the eggs, ¼ cup of milk and vanilla extract. 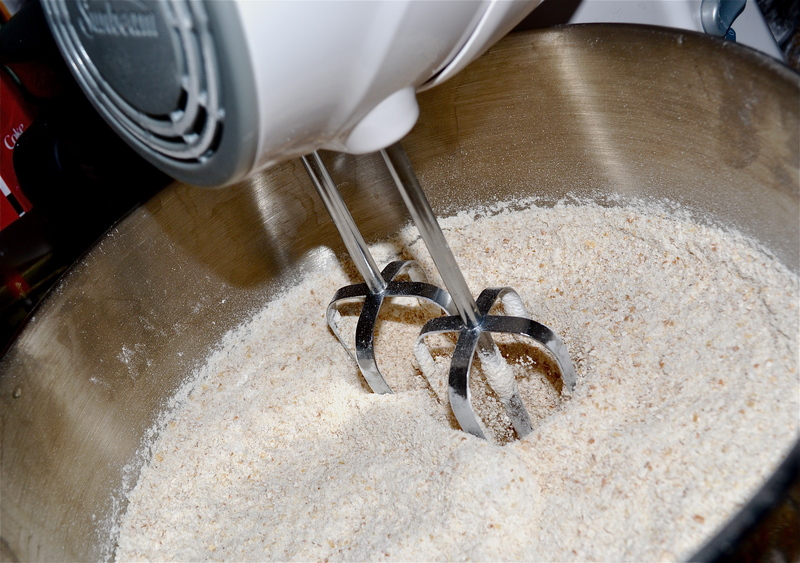 Now, combine all the dry ingredients on low in an electric mixer. 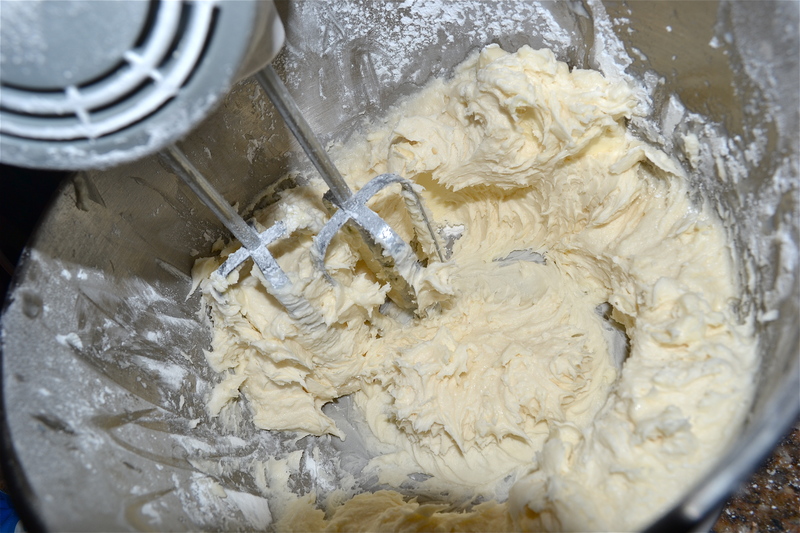 Slice the butter into 24 even pieces and then begin adding each piece at a time to the mixing bowl. 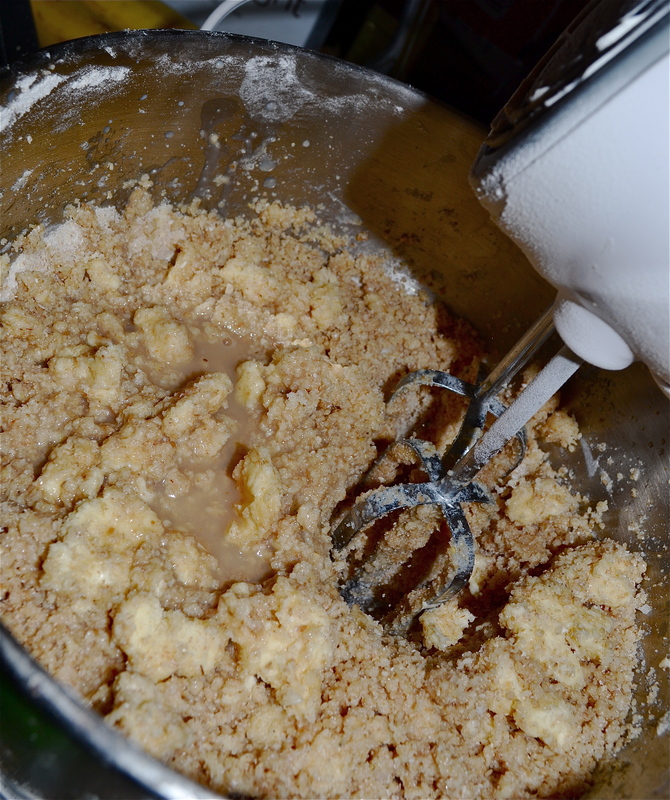 Once all the butter is in the mixing bowl, continue to combine until it looks crumbly. Once the mixture is crumbly, add the rest of the milk and the Disaronno and mix on low for a couple minutes longer. 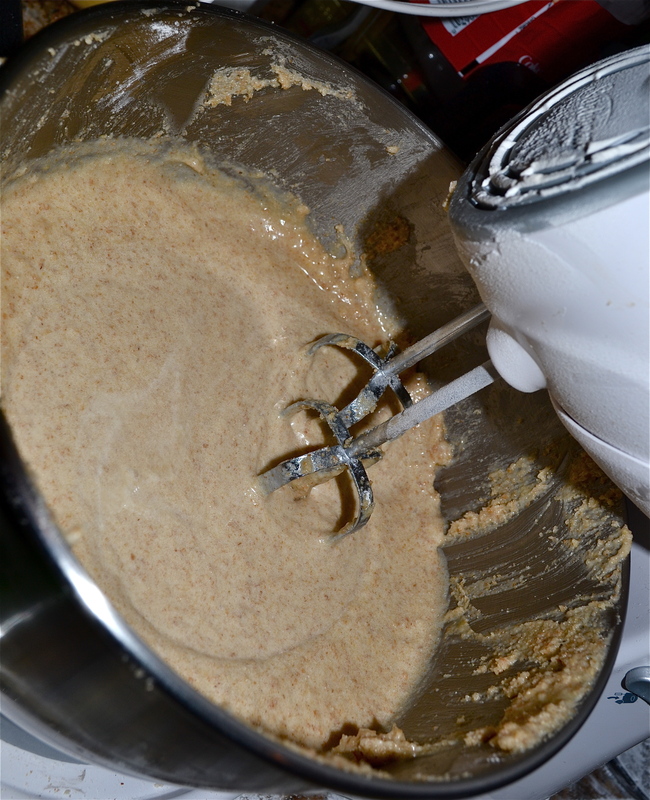 Now add the egg mixture into the mixing bowl in three batches. Add one batch at a time and continue to beat until well incorporated. Once all the eggs have been added, you will want to divide the batter into the two parchment paper-lined pans. Bake for about 20-30 minutes. Since my oven takes a while to bake, it took the whole 30 minutes, but I would start checking the center of the cake with a toothpick at around 20 minutes if you have a super duper oven. Now it’s time to make the icing. To crush the Oreos, I put them in a Ziploc bag and used a rolling pin. As much as it gets out all my frustration to slam the bag against the countertop, the bags often breaks open (which really doesn’t help with the frustration if you have cookies all over the floor). I was thankful for a rolling pin this time around. In the electric mixing bowl, begin beating the butter on medium speed. Then slowly add the powdered sugar and beat on low. Once the powdered sugar and butter are incorporated, add the vanilla extract, salt, and only 2 TBSP of milk. If the icing seems to thick, you can always add more milk; however, 2 TBSP was the perfect measurement for my icing. Lastly, I added the Oreos and slowly beat them into the icing. I took the cakes out of the oven and let them cool completely (if you are going to add the buttercream icing to them you always want to make sure the cakes aren’t warm, otherwise you risk melting the icing). 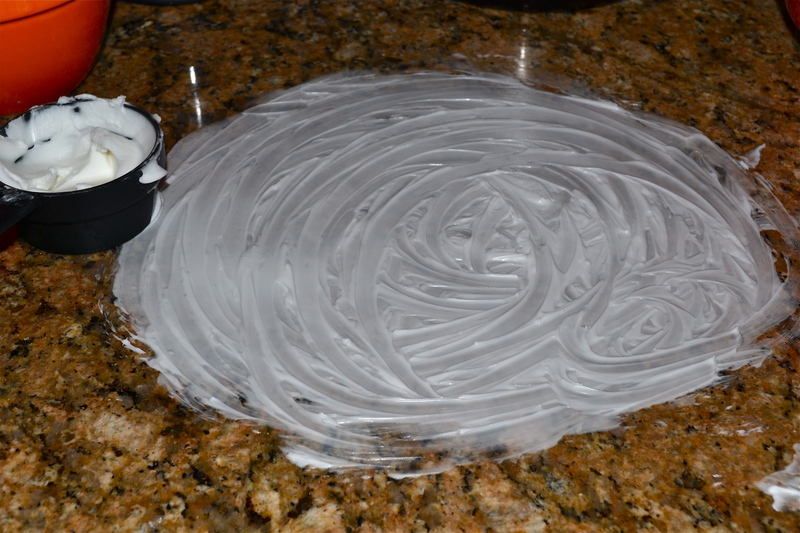 Once cool, I put the first cake on a large plate and used a spatula to rub a generous layer of icing all over. Then I added the second cake and iced the second layer, making sure to blend together the icing on both layers. Then I unwrapped my fondant and used a rolling pin to roll out evenly (mine was rolled to a little over ¼-inch thick, I believe). Then I lifted the fondant onto the cake and pinched it around the cake to make sure it was even. If there was excess, I just cut it off and tucked it into the cake. This is how the glorious birthday cake turned out. I added dye to my fondant, but it isn’t necessary and it’s kind of messy. If you want to add dye, you need food-safe gloves to wear, as the gels really stain your hands. To dye: Warm up the fondant a little bit in the microwave to make it easier to work with (I only put it in for 5 seconds). Then add a couple drops of dye to the fondant. 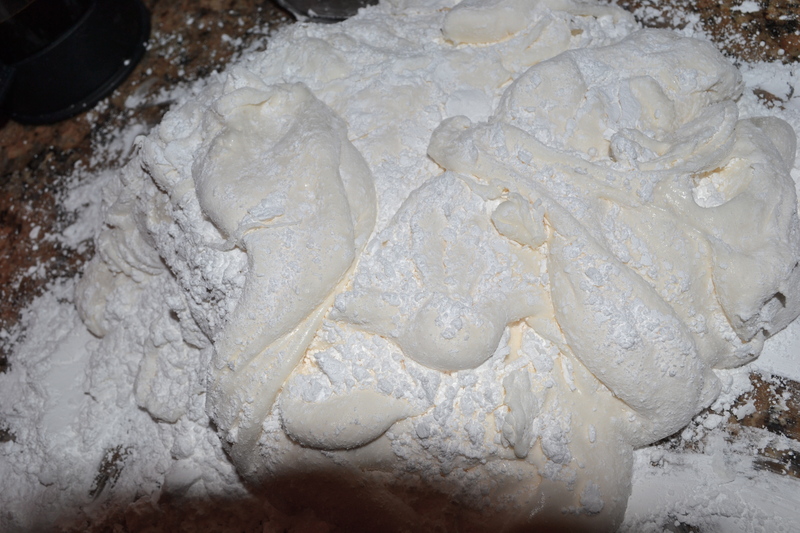 Knead until the color is completely incorporated and there are no streaks. At this point I realized I actually liked the contrast of the blue with white and decided to leave the streaks; however, at this point I may have also been tired of baking for hours. However, all these hours were completely worth it. The cake was delicious and everyone was a huge fan. It felt good to share birthday cake and celebrations with people who are dear to me. It was a very, very happy birthday indeed!